Dubai, UAE, March 26, 2019: Sanya. 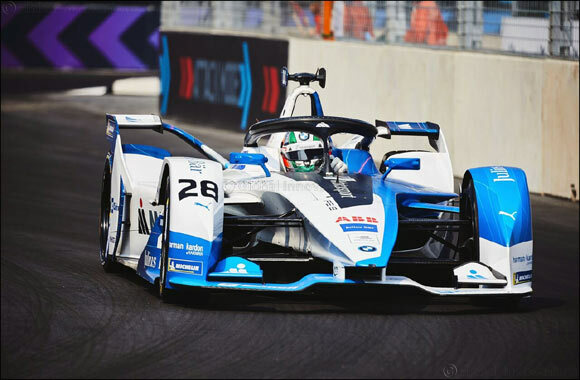 António Félix da Costa (POR) celebrated his third podium of the season at the Sanya E-Prix (CHN), round six of the ABB FIA Formula E Championship. After 36 laps he crossed the finish line in third place in the #28 BMW iFE.18. Thanks to the 15 points he picked up, Félix da Costa now leads the driver standings with 62 points. His team-mate Alexander Sims (GBR) was also among the frontrunners, but retired after an accident. Starting from third (Félix da Costa) and fifth (Sims) on the grid, the race was characterised mainly by energy management. After the frontrunners were racing defensively for more than half the race, leaving the field close together, the first duels began after around 30 minutes. In a head-to-head with André Lotterer (GER), Sims slid into the barriers, damaging his #27 BMW iFE.18 too severely to continue the race. After this incident, the BMW i8 Coupé Safety Car came onto the track, before the race was red flagged shortly afterwards. Félix da Costa defended his third place throughout the race, which ended behind the BMW i8 Coupé Safety Car after another accident in the middle of the field. With 62 points, Félix da Costa has now taken the lead in the driver standings. Sims still has 18 points to his name and is in 14th in the overall standings. In the team standings, BMW i Andretti Motorsport is in fifth with 80 points. As a result of numerous investigations after the race, the result is provisional.